Proximity, Geo-Fencing, iBeacon or Bluetooth Low Energy (BLE) Beaconsare small low-cost hardware modules which can be placed around a physical space such as an event, exhibition, store or arena. Using Bluetooth Low Energy (BLE or ‘Bluetooth Smart’) they constantly transmit a tiny unique signal which, when identified by an enabled device, can trigger notifications or updates in a dedicated app when the device enters within range. Mobile apps have become an essential investment for competitive businesses, and proximity beacon technology allows enhanced location-based functionality to provide the next level of personalisation and user experience. to give audio descriptions to tourists at specific locations around a city. iOS smartphones are already capable of interacting with iBeacons as they have the Bluetooth 4.0 required to run BLE. The vast majority of new smartphones, of any type, also feature this functionality. With no Wi-Fi, GPS or network reception required for the interaction between beacon and smartphone, iBeacon apps are the perfect solution for one-to-one user interaction. 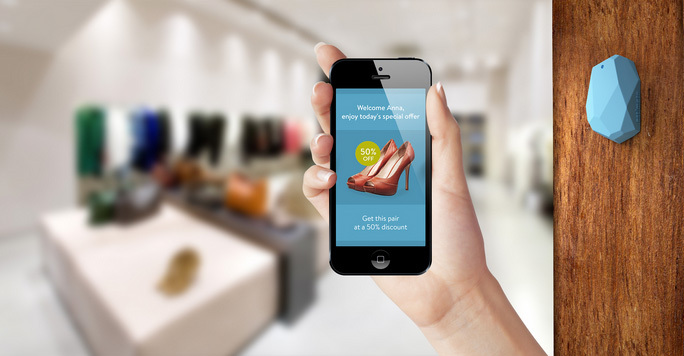 With many years of experience in mobile technology and app development, Restgate is able to offer iBeacon hardware and software solutions utilising our in-house mobile development skills. Operations – track vehicles and stock, compile checklists, transfer documentation, enhance business practices. Information – provide location-based information or navigation for museums, tours, libraries, and other large indoor or outdoor locations. Leisure – orienteering, team-building exercises, treasure hunts! Retail – mobile payments, discount notifications instore, up-to-date offers and stock. If this sounds like something you feel your business could benefit from, please don’t hesitate to get in touch for an informal discussion and free cost estimate. Sadly, Windows Mobile does not yet offer iBeacon compatibility. You can get in contact with our London or Exeter based teams online at any time or call us. We’re happy to have an informal chat or provide detailed proposals for all types of app development.